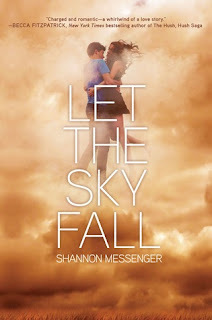 This Wednesday I have Shannon Messenger, author of Keeper of the Lost Cities and Let the Sky Fall, talking about her YA release in March! TCR: Can you described Let the Sky Fall in ten words or less? SM: Pretty much: AHHHHHH--THAT IS THE PRETTIEST THING I HAVE EVER SEEN I CAN'T BELIEVE THAT'S MY BOOK--IT'S PERFECT!!!!!!!!!!!!!!!!!!!!!!!!!!!!!!!!!!!!!!!!!!!!!!!!!!!!!!!!!!!!!!!!!!!!!!!!!!!!!!!!!!!!!!!!!! Plus some crying and jumping around and squealing. It's everything I could've wanted and SO MUCH MORE. TCR: What has surprised you the most about the writing and publication process? TCR: What is the best place for readers to stay up to date on you and your books? SM: Either my blog, or twitter. Especially twitter. I spend WAY too much time there some days. Thanks so much, Shannon! Definitely keep an eye out for both of Shannon's books! What are you looking forward to reading this week?